Breeding Stone (or Mother Stone). 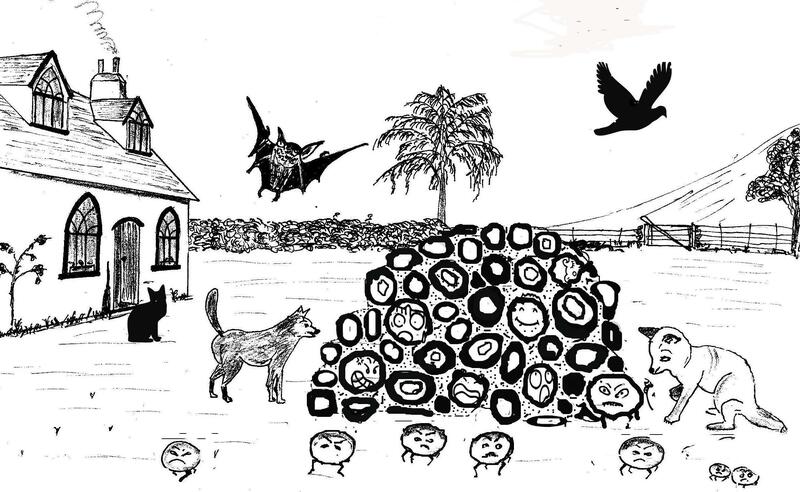 Villagers believed that breeding stones collected pebbles or fruit or children. There was a vague belief that the stones were alive, could move and had human feelings. Puddingstones exposed in fields by ploughing and erosion or frosts seem to appear from nowhere. 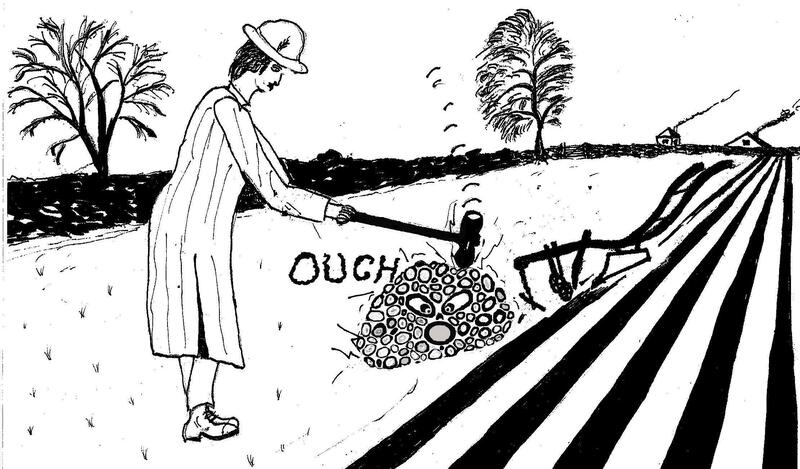 This caused a superstition among farmers that the stones grew in their fields and would damage crops and ploughshares or block streams. Many fine examples were destroyed to prevent further growth. Puddingstones known as ‘hag stones’ or ‘witch stones’ were carried in pockets or placed on doorsteps as they were believed to ward off evil. 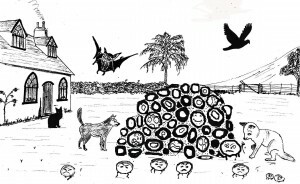 A parish record of 1662 shows how a witch was to be prevented from escaping from her grave “that a hag stone be placed on the coffin for her bodie within be bewitched”. 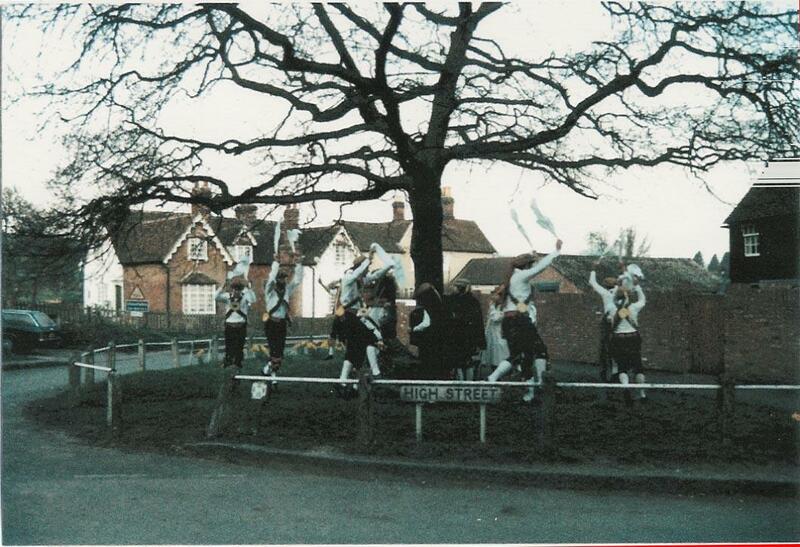 Folklore and tradition are remembered on May Day when Standon Morris dance in the dawn round the puddingstone. 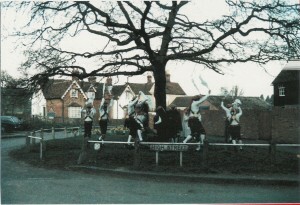 Morris dancing is now a hobby and social activity but has its roots in the return of Spring, to encourage crop fertility. 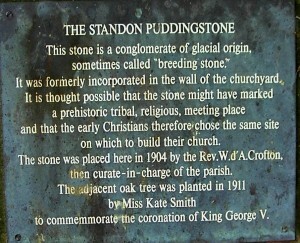 (The plaque is wrong about glacial origin, see ‘Puddingstone Formation’ page). 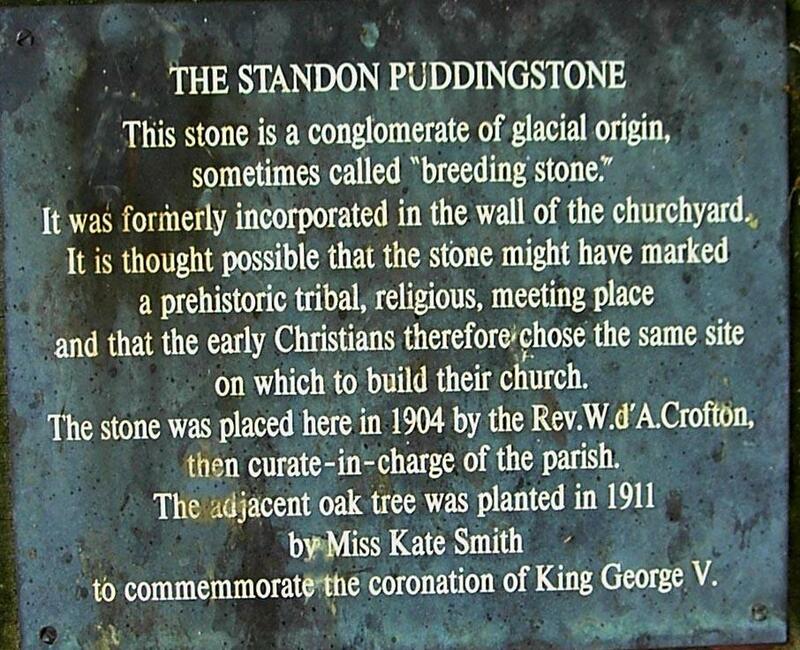 Puddingstones are often found built into or near churches as they were objects of pagan worship. In AD 601 Pope Gregory decreed pagan idols and myths should be sanctified by incorporating them into the fabric of the church. Much of the information on this page is from an article on Hertfordshire Puddingstone by David Curry © St Albans Museum. EHGC are grateful to the museum for permission to quote from this.